Learn to clean and reuse dirty water by doing water purification experiements. 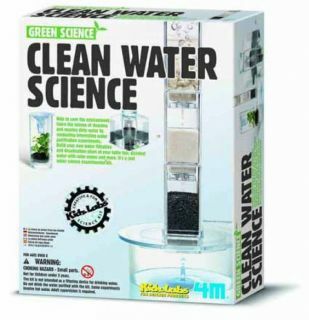 Build water filtration and desalination plant at your table top. Disinfect water with solar power. 4 filter sections & filter plugs, 3 bags of sand, 3 bags of gravel, 3 filter paper, funnel-shaped collector, small plastic cup, soft wax, fishing line, silver reflector card, etc. and experiment instruction guide with fun facts.